There are occasional references to music accompanying dramatic performances in the sixteenth and seventeenth centuries, and there are references to an organ in the Almonry building, but there is little detailed evidence of musical activities before the mid-nineteenth century. 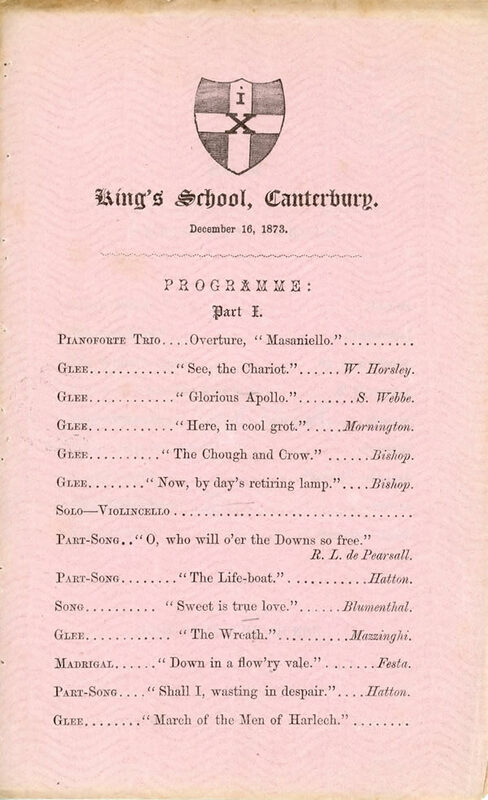 The King’s School Musical Union gave a concert in the new School Room in 1855 and there are surviving programmes of concerts from the 1870s and 1880s. The first known music master was Joseph Plant, the Master of the Cathedral’s choristers, who taught singing from 1862 to 1897. Music became firmly established within the School under Percy Godfrey, who was Music Master from 1893 to 1924. He was a composer of some note and organised imaginatively programmed concerts. The first Music Scholars are recorded in 1945. Edred Wright, initially appointed as choir master in 1955, was Director of Music from 1958 to 1978. The Music School is named after him. A tradition of musicals started in 1955 with Gilbert and Sullivan.